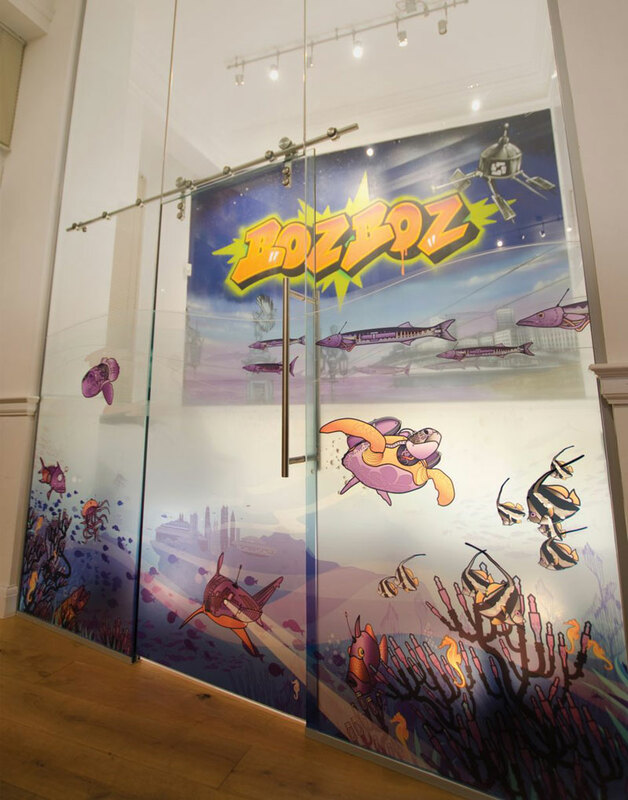 The meeting room in the new offices of Sussex-based digital agency Bozboz fully exploits the potential of Lintec’s non-PVC Vitricolour colour films. 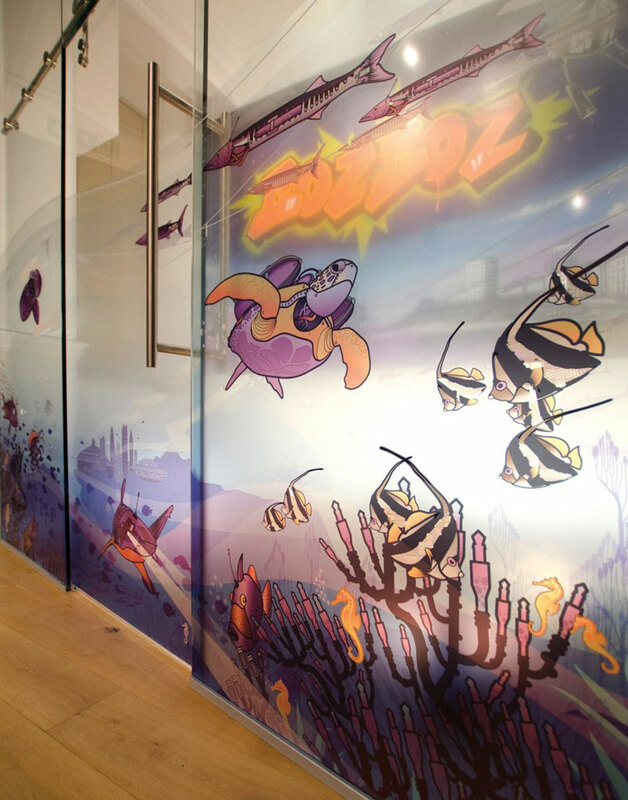 On the meeting room’s three metre-high glass wall, richly coloured robot-like marine creatures swim in and out of a coral reef composed of USB sticks and headphone jacks, an arresting fusion of the technology focus and the ‘out of the box’ thinking on which the design agency prides itself. 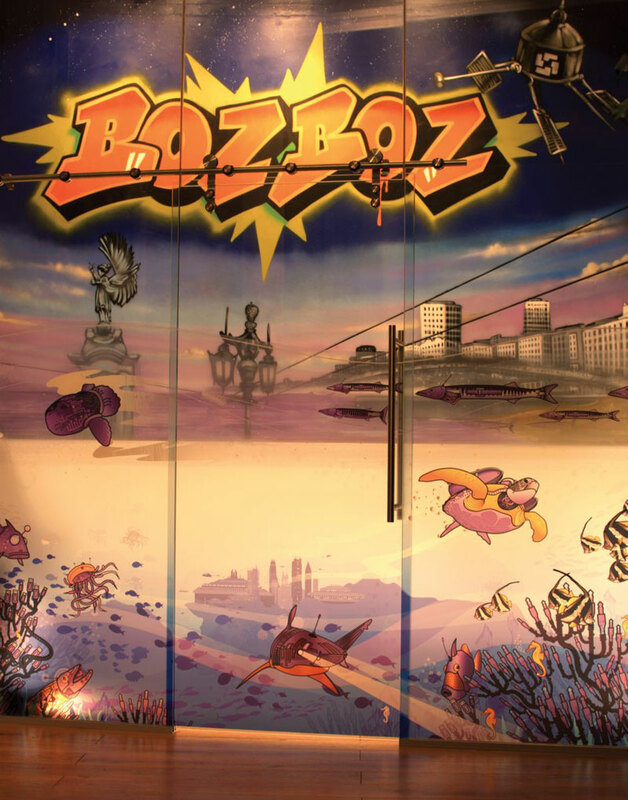 The concept also complements the equally stunning underwater-themed wall murals that stamp the Bozboz brand on other areas of the offices. The agency’s in-house graphics team came up with the original graphics idea and content and, following research to find a suitably eco-friendly colour process film, specified Virtricolour from Lintec Graphic Films. The gloss polyester film is UV-printable and offers outstanding scratch resistance, a feature especially beneficial to unprinted areas. The non-PVC film combines exceptional optical clarity, ease of installation and impressive environmental credentials and can be printed in any number of colours. It enables designers to create vibrant, eye-catching manifestations on glass, with light transmission, colour and positioning all capable of variation to match the nature of the application. PreviousA tropical beach in Woking!